Aftershocks measuring magnitudes of 5.6 and 5.8 occurred after the 7.6 quake, according to the USGS. Both were located around 70 to 75 km (43 to 46 miles) southwest of Inquique. Another strong aftershock, measured at magnitude 6.4, also struck 47 km (29 miles) west of Iquique at around 01:58 GMT Wednesday evening. This comes one day after an 8.2 magnitude quake hit 95 km (59 miles) northwest of the same area, around Iquique. After Tuesday’s quake, tsunami warnings spurred the evacuation of 900,000 people and 11 hospitals along the coastline, government officials said. At least six people died following the quake, Chile’s Interior Minister Rodrigo Penailillo said. Many of the victims died from heart attacks or falling debris. A massive 8.2 magnitude quake has struck off the coast of northern Chile, killing 5 people and displacing around 80,000. Damages and fires have been reported throughout the region and many have lost power because of the quake. 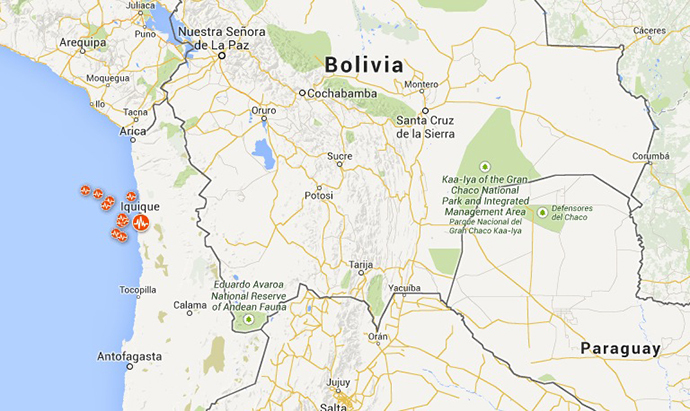 At least five people have died following the quake, Chile’s Interior Minister Rodrigo Penailillo said. In Iquique, four men reportedly died of heart attacks and in the municipality of Alto Hospicio one woman was crushed to death when a wall collapsed. In Chile, thousands of students angered at rising education costs, clashed with police in the capital, who responded with tear gas and water cannons. The students had flooded the streets for a peaceful march, still wearing their uniforms and backpacks, before it then turned violent. At least 40 were arrested. The students oppose the fact they have to pay 75% of the cost of their own educations – one of the highest rates in the world. – What’s Russia’s strategy and what does it want? – Where does China fit in vis-a-vis Syria and Iran? – What’s with Iran and Egypt? – Where is the situation headed in the region? – What is Syria going to do? On the night of May 16, thousands of Montréal students and supporters took to the streets for the 23rd consecutive night of protests, this time spurred on by the Government of Québec’s announcement that it would legislate an end to the 14-week student strike which has gripped Quebec for the past three months. As thousands poured into the streets of Montréal to oppose the government’s plan, they were again met with riot police, and as violence broke out after what was a peaceful protest was declared “illegal” by the police, 122 protesters were arrested. Only a few of the 122 arrested protesters are being charged with assaulting officers, while the rest are being charged with taking part in an “illegal protest.” Riot police charged the crowd and broke the protest up into smaller units, which police then cornered and followed, using pepper spray and flash bang grenades, as well as beating students with batons. Earlier on the same day of May 16, nearly 9,000 km away from Montréal, roughly 100,000 students and supporters took to the streets in Santiago, Chile, in the second major demonstration of the new year, bringing a resurgence to the student movement that began one year ago, in May of 2011, the students were mobilized by the Student Confederation of Chile (CONFECH), a confederation of all the student unions from public universities (as well as some private ones), and the oldest individual union, the Student Federation of the University of Chile (FECH). These usions collectively rallied the students against the most expensive educational system among the OECD nations, a largely privatized system of education brought in by Chile’s former military dictator, Augusto Pinochet, who came to power in 1973 with CIA support. Gabriel Boric, the 26-year old student leader of the FECH and spokesperson for CONFECH declared, “We are more than 100,000 people. The protests of May 16, 2012 turned violent with clashes between students and riot police, leading to the arrest of 70 students in Santiago. This was the second major student demonstration of this year, following roughly 40 demonstrations across the country in 2011. The riot police responded to the student protest with tear gas and water cannons. On March 15, Santiago was host to the first major student demonstration of the year in which several thousand students took to the streets, and clashes erupted with riot police, leading to 50 arrests. Incidentally, on March 15 in Montréal, students and others took part in a protest against police brutality which ended in violence and the arrest of over 200 protesters. The Chilean government has consistently attempted to both repress – through state violence – and undermine – through minor legislative concessions – the student movement which has identified the necessity of change in the social, political, and economic system itself. This followed revelations that Line Beauchamp attended a Liberal Party fundraiser at which she accepted donations from a known Montréal mafioso. Québec has been embroiled for years in a controversy over the corrupt construction industry, which is heavily controlled by the Mafia and gets massively over-valued public contracts from city and provincial governments. Beauchamp has not been the only such casuality in Premier Jean Charest’s cabinet. Back in September of 2011, Jean Charest’s Deputy Premier, Nathalie Normandeau, who was also Québec’s Natural Resources Minister, resigned amid controversy. She too, has been implicated in corruption scandals related to the Mafia. Roughly a month after the student protests began in Chile, the Education Minister Joaquin Lavin resigned in July of 2011. He was replaced with Felipe Bulnes, who in turn resigned in December of 2011, in the midst of the persistent student movement. Bulnes had attempted to calm student protests by granting increased access to credit and “improved supervision of universities.” Bulnes was then replaced with Harald Beyer. Just as Bulnes resigned, following revelations that he had strong ties to a private university in Santiago (and thus, a personal interest in defending the privatized education system), the Agriculture Minister Jose Antonio Galilea also resigned. In late March of 2012, Chile’s Energy Minister Rodrigo Alvarez resigned following two months of protests in the southern region of Aysen over increased fuel prices. As Quebec’s Natural Resources Minister (until her resignation in September 2011), Nathalie Normandeau was responsible for introducing ‘Plan Nord’ (Northern Plan), an $80 billion economic development program to exploit the resources of northern Québec through public and private investments. The Plan includes invesments in mining, forestry, transportation, and gas, and is drawing interest from multinational corporations around the world. The Plan envisions 11 new mining projects in the next few years, with billions being spent by the government on developing infrastructure and roads for transportation. The mining industry applauded Charest, but incited concern from environmental groups and First Nations representatives. In April of 2012, a group of First Nations Innu women walked from the North to Montreal to protest against Plan Nord, arriving in the city for the meeting to promote Plan Nord on April 20-21. On April 20, First Nations women gathered to protest the meeting, and were joined by student protesters outside the Palais des congrès in downtown Montreal. The protesters were met with riot police, sound grenades, tear gas, and batons, and roughly 90 protesters were arrested. The project provoked increased anger from residents of the region, as well as conservationists and other activists. Opponents of the project filed legal injunctions and an appeals court suspended the HidroAysen project in June of 2011. It was at this time that the student movement in Chile began to emerge rapidly. In October, a local appeals court rejected the seven lawsuits aginst the project and gave the green light to resume work. In December, a legal appeal against the project was taken to Chile’s Supreme Court. In April of 2012, the Supreme Court rejected the seven appeals against the project. This sparkedmajor protests over the court’s decision, met with riot police repression. The increased demand for energy comes from the rapidly growing Chilean mining industry, of which Canadian mining companies are the largest foreign investment source. Protests erupted in the southern Chilean region of Aysen in February of 2012, where the cost of living is significantly higher than in the north (due to the remoteness of the Patagonian region) and thus, the costs of fuel, food, health care and education were greater than elsewhere. Supporters took to the streets in Santiago in solidairty with those struggling in Aysen, also clashing with police. In March, the protesterslifted roadblocks to hold negotiations with the government and the more than thirty social organizations participating in the protests. It was after the negotiations that Energy Minister Alvarez resigned, stating that he was excluded from the talks. In late March, the government announced plans to create better conditions in the Aysen region. In April of 2012, Chile was experiencing protests against a thermoelectric plant and mining, largely participated in by Chileans of indigenous descent, and students took back to the streets in Santiago in the tens of thousands. Across Quebec, students escalated proteststhroughout the month of April, and united indigenous, environmental and student activists in protest against Plan Nord. On April 25, tens of thousands of Chilean students took to the streets in Santiago, protesting the government’s education “reform” proposal, which was grossly inadequate. On the very same day, April 25, roughly 5,000 student protesters in Montreal demonstrated against the government’s cancellation of negotiations with the student leaders. Earlier in that same month, Chilean President Pinera and Canadian Prime Minister Harper met in Chile to expand the free trade agreement between the two countries. The student movements were not up for discussion. In Quebec, the student movement, with its wider social development with labour, environmental, and other activist organizations, has been referred to as the ‘Maple Spring.” Both movements, while maintaining their own specifics, are ultimately mobilized around a struggle against neoliberalism, against austerity, and against a social, political, and economic system which has ruled the world for the few and at the expense of the many. For both of these movements to move forward, it is important to not only promote informal acts and statements of solidarity between the two movements, but to begin establishing direct and indirect ties between the movements: establishing connections between the student associations, coordinating days of major protest actions, protesting mining companies that exploit both the North of Quebec and the South of Chile, creating student-run news outlets which share information between each other, undertake student-activist exchanges between the two countries; but first and foremost, it is important to educate the students in Quebec about what is taking place in Chile, and the students in Chile about what is taking place in Quebec. That is the basis for all other forms of cooperation.